Geometry! Snowflakes are lines and shapes, and when you have large centers and broad branches, you can easily see the repetition in 60-degree angles. So then, where do the circles come from? Some circles are easy to explain, some require a bit more thinking. For an easy one, look at the off-center beauty mark in the middle. This is caused by a super-cooled water droplet colliding with the snowflake and freezing on impact, making a bump like a reverse crater. This can be an interesting feature when the collisions happen towards the edges of the branches where more water vapour is available. They become a new nucleation point for further crystal growth, and that little bump starts to get its own crisp crystal facets. There are at least three such instances in this image! The larger circles and curves are a little harder to explain, but follow me here: in slower growth, the outer footprint of a snowflake often grows in thickness rather than outward. Conditions can change to push the snowflake into outward growth again, but you’d still have this thicker “wall” on the surface of the snowflake. This can be a growth point inward – the inner edge of this wall can start to collect water vapour and grow back towards the center of the snowflake! This ends up rounding out over time, and a perfect hexagon becomes a circle. The same thing is happening in the broad branches as they grow back towards the middle, appearing like rounded flower petals beyond the edge of the central hexagon. You can even see it on some of the side-branches! When some side branches grow so closely together, they fuse. This gives a closer resemblance to the paper cut-out snowflakes we all made as kids, and it also makes for a much more solid design. Curiously though, one side-branch in the upper right is abruptly broken. It doesn’t look like it ever grew long enough to fuse with its neighbour, but was somehow broken before that – those angles are not normal growth like the other joining side-branches and it doesn’t show signs of stunted growth cased by another snowflake resting in this area. Hard to tell the complete story here! These simple branched snowflakes fascinate me almost as much as the giant ones with endless details – there is something about the simplicity that I find beautiful. It’s an interesting point to make that we find ANY snowflake to be beautiful, however. “Beauty” is a concept we hold in our minds – we call things beautiful when we feel like they are, so how does a snowflake match our internal definition of beauty when it’s normally an inanimate object inconsequential to our survival? Some deep thinking there! 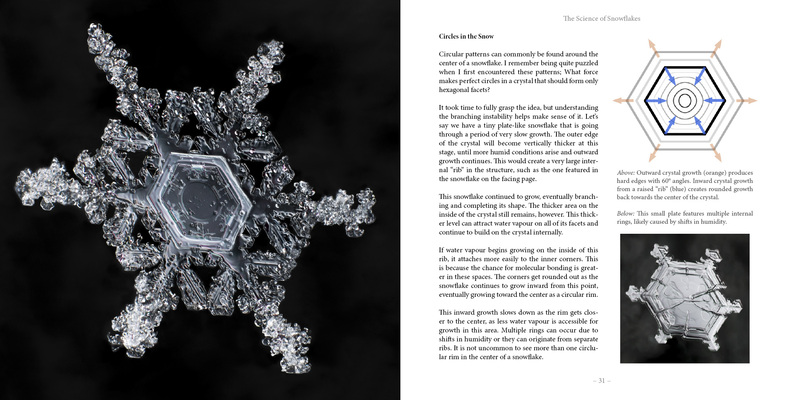 For more snowflake musings, you should consider grabbing one of the few remaining copies of Sky Crystals before it is officially out of print: https://www.skycrystals.ca/ - 304pg hardcover book on the science and photography of snowflakes – serves as a great coffee table book too!